Explore, Learn, Have Fun! 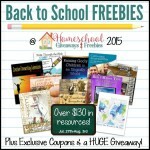 : HUGE bundle of FREE Homeschool Resources! I have to share this - we downloaded ours last night and it's full of wonderful books, curriculum and more. My son LOVES the Egyptian Warfare by Duct Tape book best of all. I can't pick a favorite - they are all wonderful! Retail value of $130! Expires on August 3 so HURRY and download your freebies while you still can! These will be perfect for supplementing our k12.com curriculum this coming school year!